Please join us at the Tower Club for their Wine Society's monthly wine tasting. In February, the spotlight is on combining two favorite of gourmets and gourmands alike, fine wines and varied chocolate-flavored delicacies. We hope you can join us. 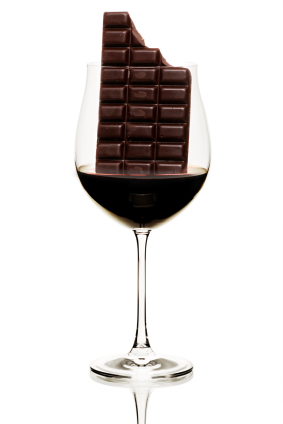 What: Some say it cannot be done, pairing wine with chocolate. But if you have the right wine to complement the right chocolate, it can be a match made in heaven! Join us as we take on the challenge and taste different chocolate-infused dishes paired with wines. Invite your friends, colleagues, clients and family (only those of legal age, of course!) for this extremely popular event. It should fill fast - almost as quickly as the glasses of wine being poured or the feasting by chocoholics on the evening of the 19th. Register: Wharton Club Members & Guests: $45/person, inclusive: all wines, aperitif, light hors d'oeuvres or appetizers with the wines, and tax and tip included. Also opportunity to save on featured wines, if they interest you. From Washington, take I66 West, to exit 66B, Rt. 7 West. Go approx. .2 of a mile and you will see a Marriott Hotel on the right. Turn right onto Fashion Boulevard. Go through 2 stop signs turn right into the parking garage of Towers Crescent. Walk out of the garage at PLAZA LEVEL and enter lobby of 8000 Towers Crescent. The Tower Club is on the 17th floor, and you must change elevators at the 14th floor to reach the Club. From Washington, take George Washington Parkway West to 495 South. From 495S take exit 47A to Route 7 West. Go approx. .2 of a mile and you will see a Marriott Hotel on the right. Turn right onto Fashion Boulevard. Go through 2 stop signs turn right into the parking garage of Towers Crescent. Walk out of the garage at PLAZA LEVEL and enter lobby of 8000 Towers Crescent. The Tower Club is on the 17th floor, and you must change elevators at the 14th floor to reach the Club. From Dulles International Airport, take the toll road (route 267). Exit to Route 7 East through Tyson’s Corner. Go approx. 1 mile, turn left onto Fashion Boulevard. Go through 2 stop signs turn right into the parking garage of Towers Crescent. Walk out of the garage at PLAZA LEVEL and enter lobby of 8000 Towers Crescent. The Tower Club is on the 17th floor, and you must change elevators at the 14th floor to reach the Club. Go South on 123, Dolley Madison/Chain Bridge Road -Turn Left on International Drive. (Sunoco gas station on left corner). Follow International Drive until Leesburg Pike/Route 7. Turn Left on Leesburg Pike/Route 7. Turn Left on Fashion Boulevard. Go through 2 stop signs turn right into the parking garage of Towers Crescent. Walk out of the garage at PLAZA LEVEL and enter lobby of 8000 Towers Crescent. The Tower Club is on the 17th floor, and you must change elevators at the 14th floor to reach the Club. Go to 495 South. From 495S take exit 47A to Route 7 West. Go approx. .2 of a mile and you will see a Marriott Hotel on the right. Turn right onto Fashion Boulevard. Go through 2 stop signs turn right into the parking garage of Towers Crescent. Walk out of the garage at PLAZA LEVEL and enter lobby of 8000 Towers Tysons. The Tower Club is on the 17th floor, and you must change elevators at the 14th floor to reach the Club.